In the pretty land of Brightvale, there is a pretty little Neohome, in which lives a pretty little Cloud Usul... and her brother, Darwin, the Yellow Poogle. They loved each other dearly, but you would never find another two siblings so different in every way; Darwin was shy and plain, dependable and industrious to a fault; his sister, Clarinda, was frivolous and fickle, but she was the life of every party and always at the top of every guest list. Clarinda spent her days exploring Neopia, always trying new foods, playing new games, meeting new friends and enjoying every day as a new adventure. Darwin, on the other hand, preferred to spend his time quietly in his own company, leaving Brightvale only to deposit his Neopoints in his saving account at the National Neopian Bank. "I think I shall go to Krawk Island today." Clarinda said with a smile one particularly bright, sunny morning over breakfast. She enjoyed a big stack of Fruity Pancakes, decked in all kinds of tropical fruit and delicious syrup, with a steaming mug of Azzle Coffee. "You sure you don't want some of these pancakes?" she asked, glancing guiltily over at the Plain Omelette that sat limply on her brother's plate. "No, thank you," he replied, swallowing another mouthful of the bland breakfast. "You know, this perfectly filling, nutritious omelette cost me just two Neopoints from another Neopian's shop. Two Neopoints for a whole meal! Can you believe that?" "Yes. Quite. Besides, you'll need a full tummy if you're going all the way to Krawk Island today." "You know, you're welcome to come with me, if you'd like," offered Clarinda, despite already knowing the answer. "Oh, no thank you. I can't imagine why you'd want to go there. All those mean pirates!" "They're not mean, they're just... full of character." "And the last time you went there, you lost all your Neopoints playing Krawps." "I'm saving them," sighed the little Poogle, as his sister left the table and hurriedly pulled on her Wellington Boots and Explorer Backpack. "What for?" she asked, as she flung open the front door and her brother followed her into the garden. "For... well, for a rainy day." "But it's always sunny in Brightvale!" exclaimed the little Usul, spreading her arms out and gesturing to the blue, cloudless expanse of the sky. "You never know," said Darwin, solemnly, as his sister hugged him goodbye. "Don't be afraid to live a little." The two siblings waved as they parted ways for the day, and not for the first time or the last, both wondered if they would ever really understand each other. Most days passed in a similar fashion; Clarinda enjoyed the best of everything Neopia had to offer, sampling the cuisine from every land with gusto, filling her closet with gorgeous clothing of every kind, gambling her Neopoints, laughing at her own losses and frittering away her winnings; while Darwin stayed in Brightvale, tending their Neogarden and selling the fruit he grew there to the shopkeeper of Brightvale Fruits for a small profit, which was immediately deposited into his bank account for safe keeping. It was on one such day, seemingly much like any other, that something dreadful happened. It was raining heavily outside, and Darwin was sat at home with a hot cup of Spring Flower Tea (only seventy-four Neopoints from a friend's shop, what a bargain! ), watching the rain cascade onto his lovely garden, from the dry warmth of the other side of the kitchen window. "Ah! Just what the Echtooh Melons need!" he smiled contentedly to himself. At that moment, the front door flew open. "Ah, Clarinda! You're home earl- oh, my!" Darwin rushed over to the doorway as fast as his stubby little legs could carry him, where his sister had collapsed in an exhausted, rain-soaked heap on the floor. "What's wrong?" he asked, pulling the little Usul to her feet and supporting her with his shoulder. "I... feel so... ugh!" gasped Clarinda, holding her hand to her head and closing her eyes. Hurriedly, the Yellow Poogle carried his sister over to the warmth of the fireplace, where he made her a comfy bed from piled up cushions and wrapped her in a warm blanket. "What happened?" he asked, as he brought her a steaming cup of Chicken Dumpling Soup. "I was at The Deserted Fairground, playing some games. I spun The Wheel of Misfortune and... well, I started to feel a bit funny, but I thought nothing of it, probably just the effects of eating some Spooky Food or something... but then I started to feel worse and worse." She put her head in her hands. "My head hurts so much, I can hardly open my eyes!" "Oh, Clarinda!" exclaimed Darwin. "I've told you so many times to be careful spinning those cursed wheels! Come on, we need to get you to the Healing Springs." The Yellow Poogle pulled his sister to her feet, she swayed unsteadily for a few moments, before falling back down again. "It's no good!" gasped Clarinda. "I'm too poorly. There's no way I can make it all the way to Faerieland!" "But we've got to do something!" protested Darwin. "How about you lie across my back and I'll carry you?" "I'm much too heavy for you to carry me all that way." "I'll have to find some other way to cure you, then," said Darwin, resolutely. "You stay here, keep warm, and get some rest. I'll be back as soon as I can." So, after providing his sickly sister with as many warm blankets as he could find and a mug of Ginger Green Tea (it was expensive, but very good for poorly Neopets), off went the little Poogle into the pouring rain, determined to find a cure. How do you find a cure, when you don't even know exactly what the illness is? The Water Faerie would know what to do for sure... but Darwin considered that speed would be of the utmost importance on this endeavour; he certainly wouldn't like to leave Clarinda on her own for very long, not in her condition. He would usually walk everywhere he needed to go, but Poogle legs are only very short, and Faerieland was not only across the sea, but also ten thousand feet in the air. Going there and then going to find a cure would take much too long. No, there was nothing else for it; Darwin would have to go straight to the source of his sister's illness and ask around there... he would have to go to the Deserted Fairground. A lump rose in Darwin's throat as he came to realise what was ahead of him; he'd have to travel through the Haunted Woods to get there. He'd avoided that terrible place for so long, he'd always hoped he'd never have to set foot on that cursed ground. Witches, ghosts, zombies, mutants, unspeakable monsters and evil around every turn... the poor little Poogle was terrified just thinking about it! All too soon his beloved Brightvale was far behind him. He'd walked this way countless times on his way to the bank; to the North, Neopia Central, he could see the rainbow shimmering invitingly in the distance; to the East, the Haunted Woods, a looming mass of darkness and fear, promising despair for any Neopet foolish enough to come closer. Darwin wanted desperately to turn around right away and run all the way home... home! Back to the land of quiet sunshine, where his adventures were confined between the pages of a book, where his biggest worry was the size of his Floranges, where his kind sister waited for him... where his kind sister was very, very sick. Darwin's mind was made up. Clarinda needed his help. He would be brave. He would be the bravest Poogle that ever lived. He would be so brave that courage would shine from his face, and all the evil creatures of the Haunted Woods would cower in terror as he marched by. Resolutely, the little Poogle pressed on, until he found himself at the entrance to the Haunted Woods. The air had grown cold and curiously still, as if the breeze itself dared not enter; there was a strange smell in the air, like damp patches on walls and rotting vine leaves; a foreboding fog hovered around the gates, as though trying to mask the horrors that lay within from the innocent eyes of the outside world. "I am not afraid," Darwin quietly lied to himself as his trembling feet took him further into the Haunted Woods, "I am the bravest Poogle that ever lived." Wait, was that his feet trembling, or the ground beneath them? The trembling grew into a rumbling, and the rumbling grew into a shaking, and the shaking grew into a violent quaking, until the ground itself seemed to rise up into a hideous mound of horror. Darwin stared in disbelief and terror at the creature that had surfaced from the earth, its eyes burned red with malice and its mouth opened wide with greed. "Uhm... no, thank you," stammered Darwin. "I'm very busy today and... uhm... some other time, perhaps?" And with that he fled, further and deeper into the shadows of the Haunted Woods, past eerie graveyards and ghostly dancing Meepits, past pits of slime and trees with grimacing faces, until he finally stopped, gasping for breath, and came to realise something even more terrible... he was lost. "Oh, no!" exclaimed Darwin, staring wildly around. He had run right off the footpath, the footpath that he had been sure would lead to the Deserted Fairground. Now the footpath, the Fairground, or even the way out was not in sight. "What's wrong?" hissed a gravely voice from the shadows above. Darwin looked up, and there in the trees above him, was the hideous face of a Mutant Korbat staring right back down at him, with its sharp fangs and twisted features. "AGH! Don't eat me!" squealed Darwin, hiding his face. "How rude!" sniffed the Korbat. "I wouldn't eat you any more than I'd eat a Spotted Sludgy. You needn't be afraid of me." "I'm not afraid of you. I am Darwin, the bravest Poogle that ever lived!" "Then why are you shaking?" "Sure." The Korbat rolled its eyes and extended a clawed hand. "Well, Dart Wind-"
"That's unfortunate. Well, Darwin, the bravest Poogle that ever lived, I am Scratches, the nicest-smelling Korbat that ever lived." "Pleased to make your acquaintance." "No, no! Of course not!" 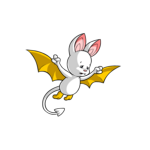 "Hah," the Korbat sniggered, and swooped down next to the blushing Poogle, "you're not from around here, are you?" "No, I'm from Brightvale. I'm here on a quest." "No, for my sister. She caught some kind of disease from the Wheel of Misfortune, and I have to find out what it was so I can cure her." "You're going the wrong way if you're headed for the Deserted Fairground," said the Korbat, raising an eyebrow. "Am I?" Darwin sighed. "I'm afraid I'm terribly lost." "Want me to show you the way?" "Oh, yes please! That would be very kind of you!" exclaimed Darwin. As the unlikely pair made their way through the Haunted Woods, Darwin's spirits lifted. He felt considerably less afraid with this surprisingly friendly local by his side, and who would have thought that such a horrifying creature would be so nice? He definitely was "full of character", as Clarinda would say, but that wasn't a bad thing. Soon they were at the gates of the Deserted Fairground. "I'll have to leave you here," said Scratches, perching on the edge of the gatepost. "Can't you come with me?" asked Darwin, who would really rather not face any more spooky creatures alone. "No, sorry," replied the Korbat, shuffling his feet in an embarrassed fashion, "I had a... a little misunderstanding with the Quiggle that runs the Coconut Shy. I'm not really welcome in here anymore." Darwin looked out over eerily quiet Fairground, and wondered how anyone could feel welcome here anyway. "Oh. Okay, I guess. I'll have to go on alone." "You'll be okay." Scratches grinned. "After all, you're the bravest Poogle that ever lived, even if you do have no sense of direction." Darwin shook hands with the Korbat again. "It was a pleasure to meet you, Mr Scratches... and you really do smell very pleasant." "The secret's Perfume Mallows," the Korbat nodded sagely, "and feel free to visit me some time. You should bring your sister over for dinner. I make a great Brain Stew." "That would be... an experience." Darwin grinned through gritted teeth as the Korbat flitted away into the darkness. And so Darwin turned to the Deserted Fairground, ready to finally find the answer to his sister's illness, and trying desperately to ignore the deranged laughter he could hear somewhere in the distance. On Scratches's advice, he kept his eyes ahead and didn't stop to speak with any of the stand owners that tried to tempt him to play their games. He'd could lose his Neopoints... or worse. Turning left at the Bagatelle stand, there it was, just ahead; the Wheel of Misfortune. Finally! He looked around for the wheel's owner, but there didn't seem to be anyone there. "Hello?" called out Darwin, and surprised himself with how little his voice shook. He almost sounded confident! "Go on, spin. You know you want to. It won't hurt... much." The voice seemed to come from nowhere until, to Darwin's horror, one of the shadows themselves seemed to step forward and gesture to the wheel. A chill ran down his spine, but he managed to find his voice. "No thank you. I'm not here to play games." "Then leave," growled the ghostly voice. It looked like the shadow of a Gelert, but no Gelerts were anywhere to be seen. "I'm here to ask you a question about your wheel. An Usul was here earlier today, a Cloud Usul. She's very ill, and I believe your wheel is the culprit." "Oh, yes, I remember her," sniggered the Gelert shadow. "Hahahaaa... she was unlucky. I bet she's feeling terrible." "She is," replied Darwin, trying to conceal his outrage at the shadow's cruel reaction to his sister's suffering. "What disease has she caught?" "A nasty one, I'm sure." The Gelert shadow seemed to be growing angry. "Now leave." "Not until you tell me what happened to my sister!" "RUN AWAY BEFORE I TEAR YOU TO PIECES!" roared the shadow, as it seemed to swell with rage and loomed over the little Poogle bearing rows of sharp spectral teeth. To his own amazement, Darwin did not run. He did not even flinch, although it felt as though his heart had leapt up in his chest. He could not win a battle with this creepy shadow, and he didn't know how to fight supernatural creatures, but there was one thing he did know, a thing all fruit sellers know... the Neopian Food Trading Rules. "Spooky Food items can be won from this wheel; this makes you a purveyor of edible items. Under the Neopian Food Trading Rules and Guidelines set down by Queen Fyora, any customer that partakes of your product and/or service is entitled to request further information regarding any aspect of your product and/or service, and you are obligated to address any and all concerns with full disclosure. I am here as a representative of Clarinda the Usul," Darwin narrowed his eyes and gritted his teeth, "and I formally request further information, Punk." The Gelert shadow paused for a moment as though deep in thought, before finally shrinking back. "Fine," it sneered, begrudgingly, "she's got Achy Head. A particularly nasty disease with a particularly expensive cure; Magic Goop." "Thank you for your cooperation," hissed Darwin, as he turned and walked away from the seethingly angry shadow. The brave little Poogle couldn't help but grin smugly to himself as he returned the way he came, and he almost swaggered back through the Haunted Woods (successfully keeping to the path this time). He really was the bravest Poogle that ever lived; friend of Mutant Korbats, explorer of the Deserted Fairground, defeater of supernatural beasts. Soon, he was out of the Haunted Woods. What a relief it was to breathe the clean, fresh air again! How lovely it was to walk on the sunshine-warmed grass! But there was no time to stop and smell the Boadasies; he had to get Clarinda that cure. He headed for Neopia Central, back along the same path he had walked countless times before, but with an entirely different objective this time. How long had he been gone? He felt like he must have been on his adventure for a very long time... poor Clarinda, left all alone all this time! Darwin broke into a run, desperate to get the cure and come home as quickly as possible. He dashed through Neopia Central, and through the doors of the National Neopian Bank. "Good evening, Sir." The Green Skeith smiled behind the counter. "It's great to see you again. What can I do for you today?" "I want to make a withdrawal." The Green Skeith raised an eyebrow. This was most irregular; the Yellow Poogle from Brightvale came in almost every day to deposit Neopoints, but had never once made a withdrawal. "Very well, Sir," said the Skeith. "Your current balance is one hundred and two thousand, four hundred and twelve Neopoints. How much would you like to withdraw?" "A hundred thousand Neopoints?" the Skeith gasped. "Surely not! You're one of our best savers, one of our most loyal customers. You'll have barely anything left!" "I know," sighed the Poogle, a faint tone of sadness in his voice, "but I need it all to buy something very expensive, but very important." The Skeith shook his head as he counted out the Neopoints and the large brown bag. "Watch out for ghosts and the tax beast!" he called, as one of his most regular customers left the bank, dragging his huge bag of Neopoints behind him. Luckily, Darwin didn't have to drag the heavy bag very far, or guard his large sum of Neopoints for very long; the Neopian Marketplace was close by, and rather than shop around for a better price as he usually would, in the interest of speed he handed ninety nine thousand, seven hundred Neopoints over to one very eager shop owner in exchange for the precious goop. As he galloped home, he couldn't help but feel a little ache for the lost Neopoints that he had saved, slowly but surely, for such a long time; but as he re-entered Brightvale, and felt the rush of relief wash over him, happy to be back in his beloved homeland, he splashed joyfully through the puddles and remembered a conversation he had with his sister so long ago. He had told her he was saving them for a rainy day, and today it certainly was rainy in Brightvale! Soon he was home, rubbing the over-priced Magic Goop onto his sister's aching head. "I'm so sorry you paid so many Neopoints for this goop, Darwin," sighed Clarinda, feeling extremely guilty, "all that hard work, gone in one go." "I can always make more Neopoints, but I only have one family." "I'll make it up to you," promised Clarinda. "I'll take you on holiday to Mystery Island or something. "Oh, no!" protested Darwin. "I've had quite enough excitement. I'd much rather stay home and tend my nice, dependable garden." But he had to admit, travel and adventure wasn't so bad after all. Perhaps tomorrow he could stop by Kiko Lake for a Glass Bottom Boat Tour, or a frivolous Choco Mint Rock Stick... on his way to the Bank, of course.